After a few days at home, I left for Bangor, Maine around noon anticipating a late evening arrival. The best laid plans often go astray and this trip was unexpectedly delayed when the plane inbound for my connection experienced a mechanical problem and arrived a full three hours late. We landed in Bangor in the wee hours and I was so grateful to see my wonderful page, Beth Calhoun. I was also grateful that Liz Hotchkiss, State Regent, chose not to meet me since we had a breakfast at 8 am, allowing only a few hours of sleep. The trip was so short there was no time for lobster but only an opportunity to visit with the friendly Maine Daughters and a desire to see more of this wonderful state. 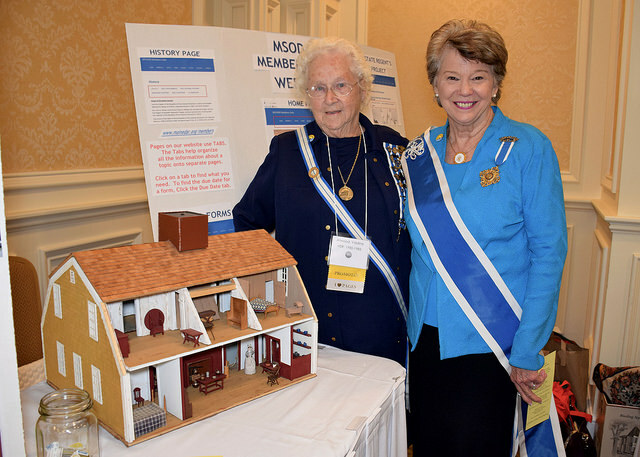 Our special guests were President General Ann Turner Dillon; State Regents Holly Blair (MA) and Nancy Zwetsch (NY); guest speaker, professional genealogist and DAR member Mary Tedesco and Rachel Lipsetts, NSDAR Development office. Workshops were presented by Mary Tedesco and State Treasurer Catherine Fisher. Our State Board of Management dinner and meeting was held Friday evening. The Pemaquid Players and Friends presented a play, “The Majabigwaduce Chapter Meets Hyacinth.” A parody of the British sitcom Keeping Up Appearances. The 2019 state budget was approved during the Board Meeting. Our Fall Meeting was the official visit of our President General therefore arrangements were made to have photographer Karen True (MADAR) join us. Our appreciation for Page Chairman Beth Calhoun and the record setting group of 16 Pages who joined us from Connecticut, Massachusetts, New York, Rhode Island and Texas. Saturday morning Mrs. Dillon, assisted by Rachel Lipsetts, hosted a breakfast for Founders and Heritage Club members. We enjoyed hearing about the improvements that had been made at our National Headquarters with our donations. During our Business Meeting, we accepted the challenge of purchasing a tree for the Pathway of Patriots! We will also partner with Wreaths Across America and their new Patriots of the American Revolution Memorial Forest in Columbia Falls, Maine. Mrs. Dillon presented the certificates for 100% Support of the President General’s Project and I presented certificates for the First Time Attendees. Our special guests brought greetings and were presented with keepsake Maine license plates. During lunch, we celebrated our Maine Children of the American Revolution. With State President Joseph Bragg unable to join us, our DAR / C.A.R. liaison Elizabeth Calhoun presented his project. Joe hopes to raise $1,500.00 to support combat injured veterans and donate it to the Travis Mills Foundation. Our traditional basket pass collected over one third of his goal. Our Saturday evening diner began with musical entertainment by Joyce Davies and was followed by Mrs. Dillon’s keynote address “A Look at our National Society.” The positive response to her address is still being received. 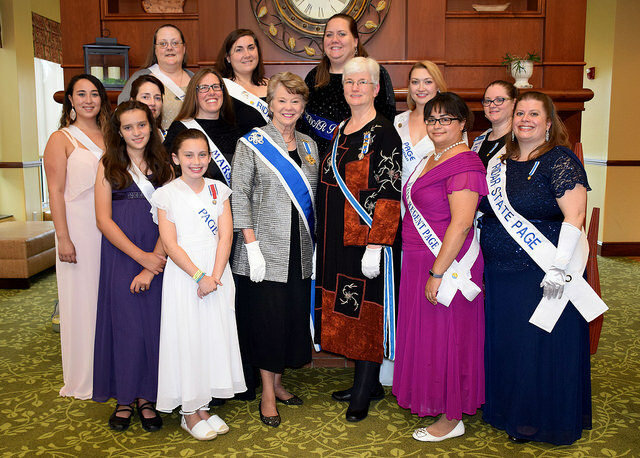 Having our President General visit, helped to connect the Maine Daughters with their National Society. Mrs. Dillon was presented with a charm of the state of Maine engraved with the date of her visit as well as a full sun charm to represent that Maine is where the first rays of the sun touch the continental United States each morning. Post Script: Before flying out from Bangor International Airport, Mrs. Dillon was given a quick tour of the Maine Troop Greeters (MTG) headquarters and presented the staff member with a DAR Challenge Coin!